In his MSc study, he studied the “Variational approach for a coupled Zakharov-Kuznetsov system and the (2+1)-dimensional breaking soliton equation”. The S2A3 medal is not the first accolade Ofentse has won. He received merit certificates during his BSc and BSc honours degrees, and in 2015/16 was the holder of the CoE-MaSS bursary, presented by the Centre of Excellence of Mathematics and Statistical Sciences. His supervisor, Prof Ben Muatjetjeja, says Ofentse is a very flexible student who is always eager to learn new ideas. 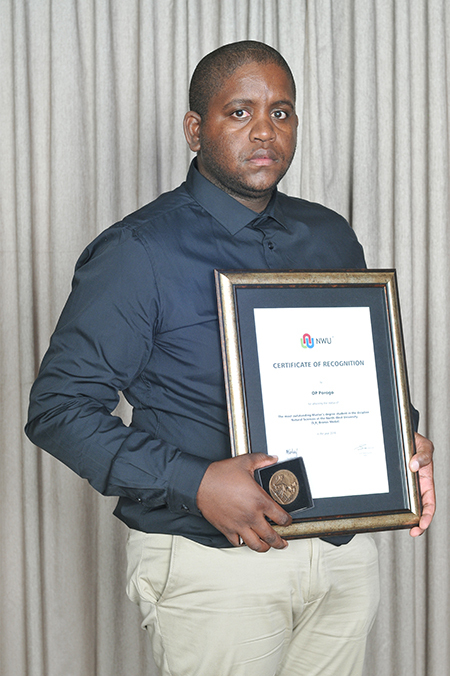 Mr Ofentse Porogo has been named the NWU’s best science master’s student.